Michael, better known as Mike, was born and raised in the small farm community of Clarksville, Ohio. He was number six of nine children, one of three boys surrounded by sisters. He loved his siblings starting with the eldest, Melvin Eugene Richardson, Diane Lynn Richardson (Taylor), Peggy Sue Greene, Verna Kay Richardson, Anna Jean Elliott, Marsha Lynn Fentress, Kathryn Marie Richardson and Russell Ray Richardson. His father, Donald Eugene Richardson (deceased), was his greatest hero. Mike spent hours as a young teen working on construction sites learning his father’s trade, a carpenter. His mother, Barbara Richardson, who resides in Blanchester, he would claim as the BEST MOM IN THE WORLD! She never missed a day where Mike did not text or call her just to say, “Love you Mom!” He married young and had his first and only son, Matthew Michael Richardson, who was his pride and joy. Shortly after Matthew was born, he felt compelled to join the Army in hopes of making a good life for him and his family. To him, it was a privilege and honor to serve his Country, which he was not shy to speak about. Years after his return from Germany where he was stationed last, he became a union electrician. This job took him many places in the U.S., from the Carolinas to Colorado. Eventually, his feet landed in the warm sands of the gulf coast of Florida, where he spent the remainder of his life. 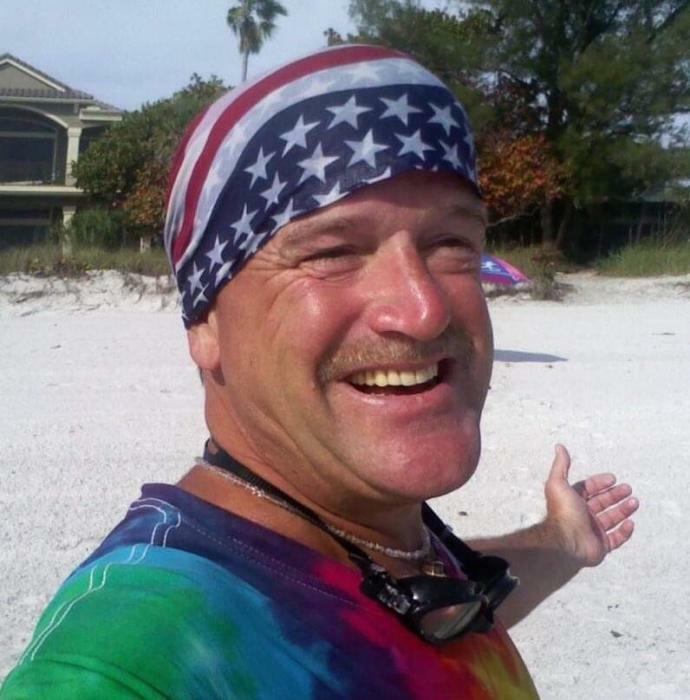 It would not be unusual to see Mike riding his bike down the sidewalk with a hat on his head, a little American flag attached to his handlebars, giving a friendly nod or a simple hello to all those he passed. A perfect day for Mike, would be with his feet in the sand, fishing pole in hand and watching a breathtaking Florida sunset as the big orange glow disappeared into the gulf waters. One thing he will miss the most, is being a part of the lives of his three beautiful grandsons, Charles Michael Richardson, William Terry Richardson and Jack David Richardson. Michael Joe Richardson, you knew no stranger, you loved God, family and your Country. You will be missed! May your feet be in the sand (next to your fathers) and a pole in hand as you enjoy heavens most magnificent sunsets! Memorial services will be held 3:00 p.m. Saturday, December 1, 2018 at the Pleasant Grove Community Church, 5704 Edwardsville Road, Clarksville. Pastor Calvin Martin will officiate. Friends may visit from 2:00 pm until the time of service at 3:00 p.m. at the church. Military honors will be accorded by the American Legion Post #49 Honor Guard. A private family burial will follow in Edwardsville Cemetery. The Brown Funeral Home, Wilmington is assisting the family. For more information, or to sign our on-line register, please visit www.arehart-brown.com or see our Facebook page, Brown Funeral Home.